Humpback whale breaching off the coast of Australia. Photo courtesy of Chris Johnson. Given its cosmopolitan distribution, the humpback whale’s range overlaps with many large whale species. However, at close range, the species is unlikely to be confused with any other, due to the distinctive characteristics illustrated above, especially the distinctively long flippers and head nodules. 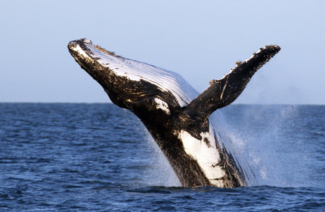 Humpback whales occur worldwide in all major oceans. While they generally demonstrate a preference for continental shelf areas, they are also known to cross deep offshore waters, and spend time over and around seamounts in the open ocean1-3. ** Note: as many populations of humpback whales increase in number following the moratorium on whaling, the species appears to be expanding its range, and is observed more frequently in areas where it was previously thought to be only vagrant, including off the coast of the Netherlands4, in various parts of the Red Sea5, and the Mediterranean6. Every known population of humpback whales, with the exception of the Endangered Arabian Sea population7, performs long seasonal migrations; spending summers feeding in cold productive waters at high latitudes and winters on tropical breeding grounds where they mate, calve, and nurse their young. Some individuals travel as far as 8,000km between their breeding and feeding grounds8. Southern Hemisphere populations generally feed around the Antarctic between November and March, and migrate toward breeding grounds near the equator where they mate and give birth between July and October1. Northern Hemisphere populations do the opposite, feeding at high latitudes off the continents of North America and Europe between June and October, and mating and calving at low latitudes in the Caribbean, West Pacific and West Atlantic between December and March or April (see map below)1,9. 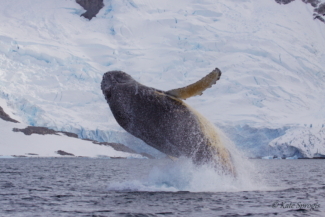 Humpback whale breaching in the Antarctic. Photo courtesy of Kate Sprogis. Map depicting the distribution of humpback whale breeding stocks in the Southern Hemisphere (depicted as the black areas labeled A-F - on the map) , as well as the 6 IWC designated management areas of humpback whale feeding grounds in the Antarctic. Humpback whales in the Southern Hemisphere feed primarily on krill, small shrimp-like crustaceans that are highly abundant in the waters around Antarctica10. Populations in the Northern Hemisphere feed on a variety of prey, including many different species of small shoaling fishes, such as anchovies, herring, sand lance, and sardines1,11. Humpback whales use a range of feeding strategies, including lunge feeding and bubble netting, a process in which whales either singly or cooperatively blow a circle of bubbles from under water in order to create a wall or curtain of bubbles that traps small schooling fish and makes them easier to capture in a single lunging gulp through the centre of the bubble curtain12,13. Humpback whales need to feed intensively throughout the summer and autumn, as they generally fast during migration and on the breeding grounds and rely on fat reserves for energy during those months. However, there is mounting evidence that at least some individuals engage in opportunistic feeding during migration or at lower latitudes associated with breeding habitat.14-16 There is also evidence that at least some individuals from some populations forego migration altogether in some years and remain on feeding grounds throughout the winter months. Shifts in ocean productivity, probably a result of climate change, have almost certainly played a role in some of the recently observed changes or anomalies in migration patterns and feeding grounds14,17. The non-migratory population of humpback whales in the Arabian Sea, probably split from other humpback whale populations in the Indian Ocean roughly 70,000 years ago18 , process most likely facilitated by the seasonal upwelling of cold, nutrient rich waters, creating feeding opportunities in the same areas that are suitable for mating, calving, and nursing. Humpback whales mate primarily on their breeding grounds in the tropics in the “wi nter months” (July-October in the Southern Hemisphere and December-March in the Northern Hemisphere). A pregnant female swims thousands of kilometers to nutrient-rich temperate or polar feeding grounds to gain sufficient strength and body mass for successful birth and lactation by feeding intensively for several months. Pregnant females usually arrive earlier than males, non-pregnant females and juveniles. Then she returns to the breeding ground to give birth after a gestation period of approximately 11.5 months3. Mothers and calves generally remain in shallow, sheltered waters19 where the calf nurses and gains the weight and strength required to migrate back to the feeding grounds. Males on the breeding ground engage in aggressive competitive behaviours to gain access to females20, and also produce long complex songs, with all males in the population singing roughly the same song, but slowly changing it over the course of a breeding season21. Humpback whale feeding in the Antarctic. Photo courtesy of Kate Sprogis. Much of what we know about humpback whales today has been learned through photo-identification studies, in which individual whales are photographed and recognized over time by the unique serrations and patterns on the trailing edges and undersides of their tail flukes. In well-studied populations, such as the feeding grounds in Alaska and the Gulf of Maine, some individual whales have been monitored for over 40 years22. 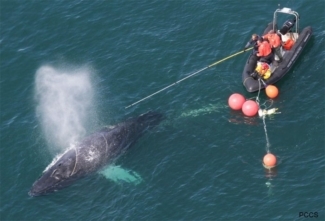 Technologies like genetic sampling and satellite telemetry (the attachment of small devices that send the whales’ GPS position to satellite receivers) allow researchers to track whales’ movements and gain more insight into their (seasonal) migrations and fine-scale use of habitat on the breeding grounds and feeding grounds23. More information about research techniques used to study whales and dolphins can be found here. Natural Predators: Humpback whales often bear rake-like scars on their bodies indicating that they survived an attack by killer whales. Some researchers have proposed that the threat of killer whale attacks, particularly on vulnerable calves, has an important influence on humpback whale behaviour and migration24-26. Large sharks are also potential predators of this species, especially of very young calves27. Human-induced threats: Humpback whales may be at risk from a number of threats, including entanglement in fishing gear, ship strikes, habitat degradation, oil and gas development and climate change17. The significance of the impacts of these threats vary across populations. 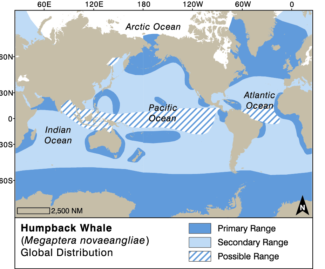 Those populations that are small or that have a restricted range, such as the endangered Arabian Sea population,7 are of particular concern. Many populations of humpback whales were heavily hunted through the 1960’s, when Soviet whaling operations were still catching humpback whales in the Southern Oceans, the Pacific and the Arabian Sea despite an IWC agreement to stop hunting this species from 1963 onward28-30. The majority of humpback whale populations are recovering well – for example, the recent IWC assessment of Southern Hemisphere humpback whales estimated that overall numbers were at around 70% of the number of whales thought to be in the Southern Hemisphere before hunting began. Globally the species was moved from a status of Vulnerable to Least Concern by the IUCN Redlist of Threatened Species31. However, it is under Appendix 1 of the Convention on Migratory Species (CMS), and certain (sub)populations, such as that in the Arabian Sea, are considered endangered by, IUCN7, the United States Endangered Species Act (ESA)32, and the IWC33. Humpback whales are still hunted in very small numbers under aboriginal subsistence whaling permits and conservative and sustainable quotas are set by the IWC in Greenland and St. Vincent and the Grenadines. There may also be some small-scale hunting of humpback whales around the island of Pagalu in the Gulf of Guinea, but no recent information is available. 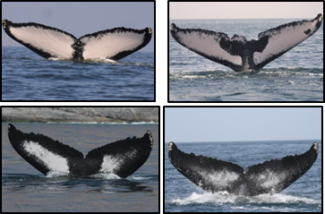 Examples of humpback whale tail fluke photographs used to identify and recognise individual whales over time. Photos courtesy of the Environment Society of Oman. 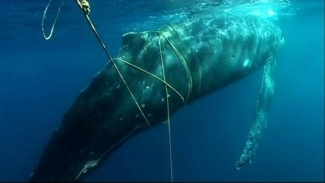 Humpback entangled in lobster pot gear off Western Australia. Photo courtesy of the Australian Dept of Environment and Conservation (DEC). Professional response team releasing a humpback from lobster pot gear off the coast of Maine. Photo courtesy of the Center for Coastal Studies (CCS), Provincetown. Humpback whales are one of the species most often targeted by whale watching around the globe. Because they are often approachable, and engage in fun-to-observe behaviours like breaching, lob-tailing and pectoral fin slapping – they make ideal targets for tourism. While studies indicate that they do display short-term responses to whale watching vessels that has the potential to impact their overall long-term fitness34,35, no evidence to date suggests that responsible whale watching has a negative impact on humpback whales at the population level.36 and many of the most-watched humpback whale populations continue to increase in number36,37. However, given the mounting pressures from other threats around the globe (see above) and the stress that can be caused to individual whales through overly close or prolonged vessel presence, it is extremely important that whale watching does not compound threats, but instead contributes to conservation by adhering to responsible whale watching guidelines. 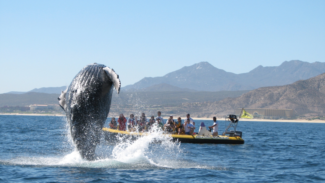 Humpback whale breaching off the coast of Mexico. Photo courtesy of Ursula Gonzales. Clapham, P. J. in Cetacean Societies (eds J. Mann, R.C. Connor, P.L. Tyack, & H. Whitehead) 173-196 (University of Chicago Press, 2000). Cerchio, S. et al. Satellite telemetry of humpback whales off Madagascar reveals insights on breeding behavior and long range movements within the Southwest Indian Ocean. MEPS 562, doi:10.3354/meps11951 (2016). Clapham, P. in Encyclopedia of Marine Mammals (eds W. Perrin, B. Wursig, & J.G.M. Thewissen) 582-584 (Elsevier, 2009). Ryan, C. et al. A longitudinal study of humpback whales in Irish waters. Journal of the Marine Biological Association of the United Kingdom 96, 877-883 (2016). Notarbartolo di Sciara, G., Kerem, D. & Smeenk, C. Cetaceans of the Red Sea. CMS Technical series (In press). Genov, T., Kotnjek, P. & Lipej, L. New record of the humpback whale (Megaptera novaeangliae) in the Adriatic Sea. Annales ser. hist. nat. 19, 25-30 (2009). Minton, G. et al. Megaptera novaeangliae, Arabian Sea subpopulation. IUCN Red List of Threatened Species http://www.iucnredlist.org/det... (2008). Palsboll, P. J. et al. Genetic tagging of humpback whales Nature 388 767-769 (1997). Allen, J. M., Rosenbaum, H. C., Katona, S. K., Clapham, P. J. & Mattila, D. K. Regional and sexual differences in fluke pigmentation of humpback whales (Megaptera novaeangliae) from the North Atlantic Ocean. Canadian Journal of Zoology 72, 274-279 (1994). Murase, H., Matsuoka, K., Ichii, T. & Nishiwaki, S. Relationship between the distribution of euphausiids and baleen whales in the Antarctic (35§E - 145§W). 135-145 (2002). Fleming, A. H., Clark, C. T., Calambokidis, J. & Barlow, J. Humpback whale diets respond to variance in ocean climate and ecosystem conditions in the California Current. Global Change Biology, n/a-n/a, doi:10.1111/gcb.13171 (2015). Hain, J. H., Carter, G. R., Kraus, S. D., Mayo, S. A. 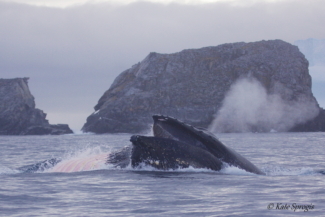 & Winn, H. E. Feeding behaviour of the humpback whale, Megaptera novaeangliae, in the western north Atlantic. Fishery Bulletin 80, 259-268 (1982). Jurasz, C. M. & Jurasz, V. P. Feeding modes of the humpback whale, Megaptera novaeangliae, in Southeast Alaska. 31, 69-83 (1979). Findlay, K. P. et al. 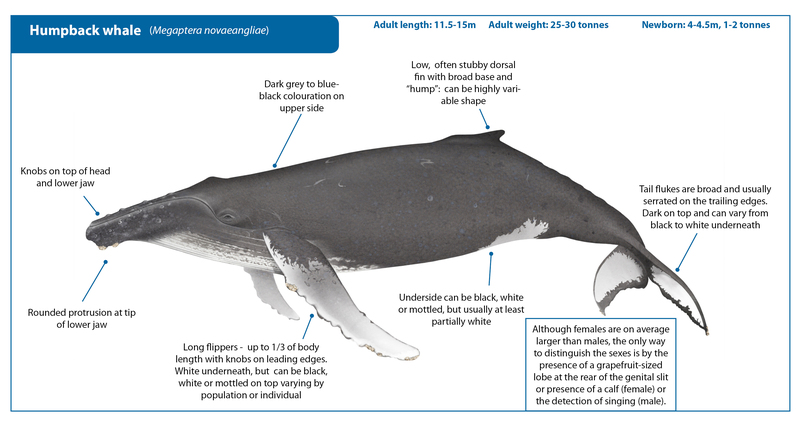 Humpback whale “super-groups” – A novel low-latitude feeding behaviour of Southern Hemisphere humpback whales (Megaptera novaeangliae) in the Benguela Upwelling System. PLOS ONE 12, e0172002, doi:10.1371/journal.pone.0172002 (2017). Alves, L. C. P., Andriolo, A., Zerbini, A. N., Pizzorno, J. L. & Clapham, P. J. 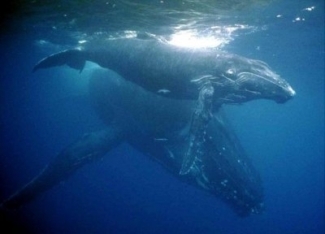 Record of feeding by humpback whales (Megaptera novaeangliae) in tropical waters off Brazil. Marine Mammal Science 25, 416-419 (2009). Barendse, J. et al. Migration redefined? Seasonality, movements and group composition of humpback whales Megaptera novaeangliae off the west coast of South Africa. African Journal of Marine Science 32, 1-22 (2010). Thomas, P. O., Reeves, R. R. & Brownell, R. L. Status of the world's baleen whales. Marine Mammal Science, doi:10.1111/mms.12281 (2015). Pomilla, C. et al. The World's Most Isolated and Distinct Whale Population? Humpback Whales of the Arabian Sea. PLoS ONE 9, e114162, doi:10.1371/journal.pone.0114162 (2014). Craig, A., Herman, L. M., Pack, A. A. & Waterman, J. O. Habitat segregation by female humpback whales in Hawaiian waters: avoidance of males? Behaviour 151, doi:10.1163/1568539x-00003151 (2014). Tyack, P. & Whitehead, H. Male competition in large groups of wintering humpback whales. Behaviour 83, 132-154 (1983). Winn, H. E. et al. Song of the humpback whale - population comparisons. Behavioral Ecology and Sociobiology 8, 41-46 (1980). Gabriele, C. M. et al. Natural history, population dynamics, and habitat use of humpback whales over 30 years on an Alaska feeding ground. Ecosphere 8, e01641-n/a, doi:10.1002/ecs2.1641 (2017). Cerchio, S. et al. Satellite telemetry of humpback whales off Madagascar reveals insights on breeding behavior and long-range movements within the southwest Indian Ocean. Marine Ecology Progress Series 562, 193-209 (2016). Corkeron, P. J. & Connor, R. C. Why do baleen whales migrate? Marine Mammal Science 15, 1228-1245 (1999). Mehta, A. V. How important are baleen whales as prey for killer whales (Orcinus orca) in high-latitude waters? , Boston University, (2004). Mehta, A. V. et al. Baleen whales are not important as prey for killer whales Orcinus orca in high-latitude regions. Marine Ecology Progress Series 348, 297-307 (2007). Clapham, P. J. & Mead, J. G. Megaptera novaeangliae. Mammalian Species 604, 1-9 (1999). Clapham, P. J. et al. Catches of Humpback Whales, Megaptera novaeangliae, by the Soviet Union and Other Nations in the Southern Ocean, 1947–1973. Marine Fisheries Review 71 (2009). Doroshenko, N. V. Soviet catches of humpback whales (Megaptera novaeangliae) in the north Pacific Soviet Whaling Data (1949 - 1979), 48-95 (2000). Mikhalev, Y. A. Humpback whales Megaptera novaeangliae in the Arabian Sea. Marine Ecology Progress Series 149, 13-21 (1997). Reilly, S. et al. Megaptera novaeangliae. The IUCN Red List of Threatened Species http://www.iucnredlist.org/det... (2008). NOAA. (eds National Oceanic and National Marine Fisheries Service (NMFS) & Commerce. Atmospheric Administration (NOAA)) 247 (Department of Commerce, Washington DC, USA, 2016). IWC. Report of the Scientific Committee of the International Whaling Commission 2016: Annex H: Report of the Sub-Committee on Other Southern Hemisphere Whale Stocks. 44 (International Whaling Commission, Bled, Slovenia, 2016). Weinrich, M. & Corbelli, C. Does whale watching in Southern New England impact humpback whale (Megaptera novaeangliae) calf production or calf survival. Biological Conservation 142, 2931–2940 (2009). 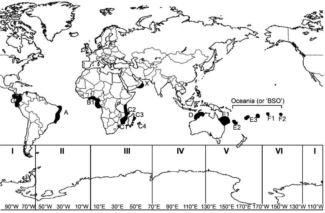 Andriolo, A., Kinas, P., Engel, M., Martins, C. & Rufino, A. Humpback whales within the Brazilian breeding ground: distribution and population size estimate. Endangered Species Research 11, 233–243 (2010).